New App Alert: Veggie Bottoms Kitchen Is A Recipe For Family Fun - I Am Proud Of My Kids! 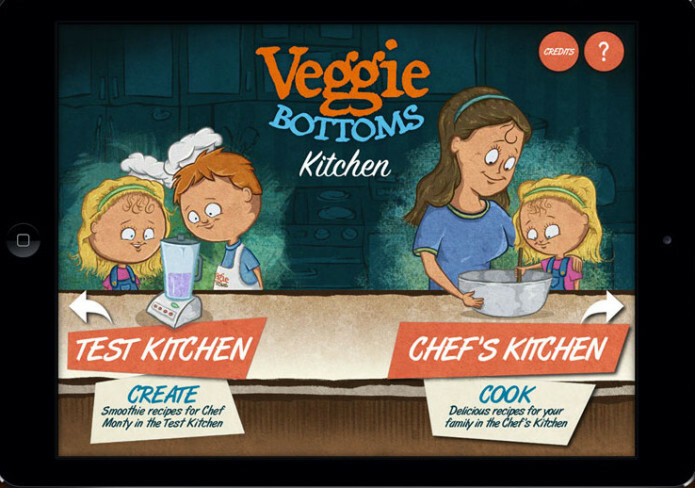 Veggie Bottoms Kitchen, a new app from Red Card Studios, is the perfect cooking companion for kids who want to get more confident in the kitchen, and for parents who want to encourage the family to stay healthy. Eating fruits and vegetables has never been so fun! What is Veggie Bottoms Kitchen? Veggie Bottoms Kitchen uses playful animated characters like John Lemon (“a bit of a sour chap”), Sophia Broccoli (“green and beautiful from head to stem”), and Charles Chard III (“a lean, green, vitamin-packed machine”) to introduce over forty kid-friendly, vegetarian recipes from all over the culinary map: kiwi pizza, banana bon bons, African peanut soup, marketplace coconut curry, and much more. Browse recipes by tapping on your favorite fruit or veggie character or filter the recipes by dietary restrictions for the allergy-conscious. The recipes of Veggie Bottoms Kitchen were created by a certified nutritionist to help remind people that cooking doesn’t have to be hard, and eating healthy doesn’t have to be boring. Want to create your own recipes? Veggie Bottoms Kitchen also includes the “Test Kitchen,” – an area dedicated to letting kids mix up their own smoothie concoctions in a virtual blender for Chef Monty to try. Keep playing and you might just unlock some of his secret smoothie recipes! Cook, create and play in the kitchen with Veggie Bottoms Kitchen. The app was developed by Red Card Studios as a follow-up to their award-winning interactive book Veggie Bottoms, which first introduced this world of fun, colorful, vitamin-packed characters. Veggie Bottoms Kitchen 1.0 is $1.99 USD (or equivalent amount in other currencies) and available worldwide exclusively through the App Store in the Food & Drink category. For more information, please visit Veggie Bottoms Kitchen’s official website or connect with us on Facebook, Twitter, and LinkedIn (@RedCardStudios). Be the first to comment on "New App Alert: Veggie Bottoms Kitchen Is A Recipe For Family Fun"